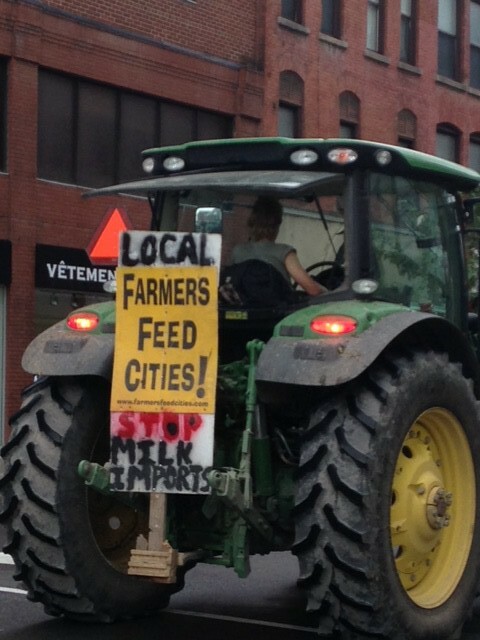 On September 29, Dairy farmers from eastern Ontario took their tractors to protest on Parliament Hill. Conservative Trade Minister Ed Fast flies to Atlanta this week to continue talks on the 12-nation Trans-Pacific Partnership (TPP), one of the largest and most important free trade agreements ever negotiated. A deal is no foregone conclusion—negotiators have already missed several deadlines—but expectations are high that this week’s meetings in Georgia will resolve all outstanding issues and Minister Fast will return home with an agreement in hand. Should we be excited? What exactly do Canadian citizens have to gain from the TPP and what are we offering up in exchange? Unprecedented secrecy by negotiators means details are sparse, but what we do know paints a worrying picture. Tariffs are already low between TPP countries, and Canada already has free trade agreements with the U.S., Mexico, Chile and Peru. Eighty percent of Canadian exports to the other TPP countries are raw or semi-processed goods (like coal and lumber) while eighty percent of imports are high value-added goods (like cars and computers). If the TPP encourages greater trade, it will serve to exacerbate Canada’s trade deficit with these countries and further weaken our struggling manufacturing sector. The Canadian government has not published a study of the deal’s potential economic impact, but independent analyses offer grim forecasts. An UNCTAD study predicts a 26% drop in Canada’s value-added exports as a consequence of the TPP. Even optimistic U.S. government forecasts predict no net GDP growth for Canada due to the TPP. Canada’s supply-managed agricultural industry is on the chopping block in this deal, which threatens thousands of jobs in addition to our food security. The automotive industry is also at risk with potentially “catastrophic effects” in terms of jobs and exports. But some of the TPP’s most worrying provisions have almost nothing to do with trade at all. Increased intellectual property protections in the deal will undermine generic pharmaceuticals leading to higher drug costs across the country. Canadians’ privacy is at risk from rules that would allow the unregulated transmission of personal information across borders. And new copyright rules would rewrite Canadian law to allow stricter penalties for infringement and better protect tobacco companies’ branding. To make matters worse, the TPP includes an investor-state dispute settlement (ISDS) mechanism, which will allow foreign corporations to sue governments for actions that interfere with their investments. The ISDS mechanism in NAFTA has already forced the Canadian government to backtrack on important environmental and public health regulations. Exposing Canadian governments to TPP investors invites even more challenges to government actions taken in the public interest. Meaningful action on climate change is put at serious risk by these special protections for foreign investors. The way the TPP has been negotiated—hidden from the public but with heavy involvement from corporate lobbyists—is reason enough to be sceptical of the agreement. 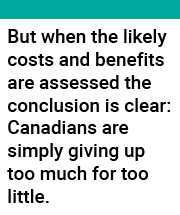 But when the likely costs and benefits are assessed the conclusion is clear: Canadians are simply giving up too much for too little. The TPP looks like a bad deal for Canada. With a pivotal federal election just weeks away, it’s time for the parties to talk honestly about what’s at stake in these negotiations. Ed Fast might come home with an agreement in hand, but it’s the next government that will be responsible for ratification and implementation. The fate of the TPP lies in their hands. For more information on Canada and the Trans-Pacific Partnership, read CCPA’s TPP Fact Sheet.